Juvederm Ultra XC in Fontana is now available at True Beauty Aesthetics. Dermal fillers are a group of non-toxic substances that are injected under the skin at various depths to smooth out fine lines, deep wrinkles, nasolabial folds, and acne scars, volumize and define lips, contour the chin and nose, or plump up sunken cheeks or temples for a full, lifted appearance. Juvederm Ultra Plus (Allergan) is a thicker version of it’s sister dermal filler, Juvederm Ultra, which is why it is used to correct more severe facial wrinkles, deep nasolabial folds (the lines from your nose to the corners of your mouth), and marionette lines (the lines from the corners of your mouth down toward your jawline) and to fill in depressed areas in the cheeks. It may also be used in a “liquid face lift” procedure to sculpt and reshape facial contours or as a hand rejuvenation treatment. Juvederm Ultra Plus XC is the exact same formula, but contains lidocaine, an anesthetic, to make the injection more comfortable. What is Jovederm Ultra Plus Made Of? Juvederm Ultra Plus is made with a hyaluronic acid gel. “Hyaluronic acid is a sugar that’s found naturally in your skin and makes your joint spaces feel slippery. Its function is to absorb water, deliver nutrients and act as a cushioning agent. So when you inject it into your skin, it acts like a sponge and expands to fill in wrinkles and folds and support sunken areas,” explains Dr. Sina who specializes in cosmetic dermatology in his Fontana boutique clinic. The extra water brought to the skin’s surface also imparts a fresh, glowing radiance and a soft, supple skin texture. These injections induce a robust production of collagen, which helps to further firm and plump your skin and reduce wrinkles over time. There are various brands of fillers comparable to Juvederm® Ultra Plus and they all have slightly different compounds and consistencies and are designed to be injected at various depths within your skin. It’s really up to your cosmetic doctor to choose which ones are best to address your issues, but in general, Juvederm® Ultra Plus is thicker than Belotero, Restalyne, and Juvederm® Ultra, and pretty equivalent to Perlane. It’s meant to be injected deeper into the skin than the lighter dermal fillers for more intense correction. In many cases, a combination of two or more dermal filler brands applied to different areas will be most effective for optimal facial rejuvenation. A few words of caution: “If a hyaluronic acid based dermal filler gets inadvertently injected into a blood vessel, it can cause some significant side effects such as skin breakdown, ulceration, or necrosis of the skin. Thankfully, a quick injection of hyaluronidase, an enzyme, can immediately reverse those negative effects,” explains Dr. Wattenberg. It’s important you go to a qualified cosmetic doctor who can quickly diagnose this type of situation and administer the antidote. Browse The Book for the best experts in your city. Improper injections can also result in an infection. Juvederm® Ultra Plus treatments in Fontana show results on all skin types and skin colors, but are ideal for those seeking to smooth deep wrinkles and folds, and plump areas with moderate to deep skin depression or fat loss. They are also ideal for those seeking to rejuvenate the skin on their hands. Women who are pregnant or breastfeeding should not use dermal fillers. Anyone who has recently used blood thinners or has a bleeding disorder should also avoid dermal fillers. You should be cautious if you’ve had previous bad allergic reactions that have required in-hospital treatment. 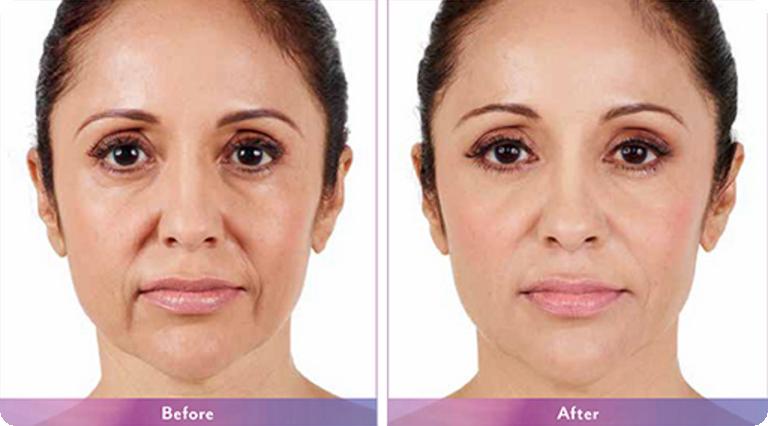 Juvederm® Ultra Plus treatments are fast and relatively painless. Typically, a local or topical anesthetic is first applied to eliminate any discomfort. Once that takes effect, the dermal filler, a thin gel-like substance, is injected into the target area using a tiny, fine needle. There is no downtime associated with Juvederm® Ultra Plus treatments. Immediate visible side effects are minimal and may include temporary redness, tenderness, swelling, or bruising at the injection site, and can easily be concealed with makeup. In rare cases, small bumps may appear under the skin at the injection site. If they don’t dissipate within a week, check back in with your doctor. Dr. Sina will make sure that you reach your goals by applying Juvederm Ultra XC in Fontana at True Beauty Aesthetics. Everyone can experience different results. A dose in one woman can result in a dramatic change, while it may have a very minimal impact on someone else. The effects of a Juvederm® Ultra Plus injection should be immediate, with continuous correction as new collagen regenerates. The area of injection should instantly appear smoother and fuller, with more volume and definition than before receiving the treatment. One injection of Juvederm Ultra Plus should last 6 to 12 months, depending on how fast your body will naturally break it down. 1 to 2 treatments per year will help maintain results. Over time, you may actually need less frequent visits and smaller doses thanks to the long-term benefits of creating new collagen. You should only visit an actively board certified dermatologist or plastic surgeon. Dermatologists should be certified by the American Board of Dermatology (ABD). Plastic Surgeons should be certified by the American Board of Plastic Surgery (ABPS). Both of those boards are part of the American Board of Medical Specialties (ABMS), a non-profit organization that is considered the gold standard of physician certification. Every patient is different. Therefore; we recommend you to consult with Dr. Sina for Juvederm Ultra XC in Fontana.